Tickets purchased. Bag packed. Stomach empty. I was ready to eat Lithuanian food, hang out with old friends and speak Lithuanian to anyone willing to listen, including some French tourists who I mistakenly assumed were Lithuanian. All was right when they heard me say “Frank Zappa” as they too were on a quest to find the Frank Zappa bust in Vilnius. 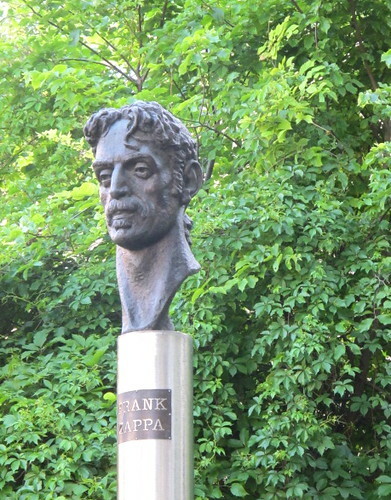 What better symbol of freedom and democracy than a bust of the late, great Frank Zappa? 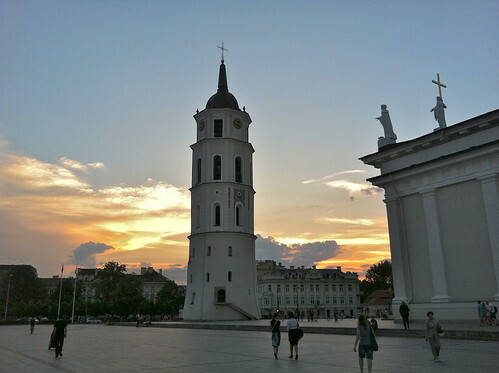 Speaking of tourists, I was shocked and amazed to see tourists from all over the world in Vilnius. As I checked into my hotel, I was greeted with the familiar sound of Japanese being spoken in the lobby. Familiar in Japan anyhow. 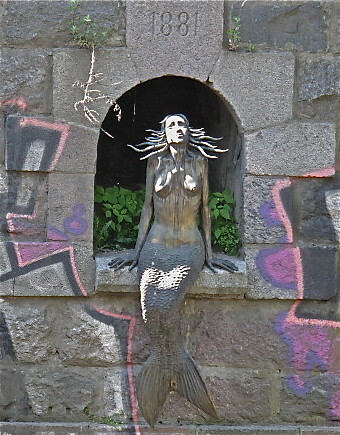 In Vilnius it seemed a little odd. As it turned out, there were 20 Japanese folks getting ready to see what Vilnius and the rest of Lithuania had to offer. How and why they chose this as their vacation destination had me slightly baffled. Hadn’t these people heard of Paris or Santorini or Egypt or Monaco? Perhaps they’d already been to those places and they wanted something with more edge? or blander food? 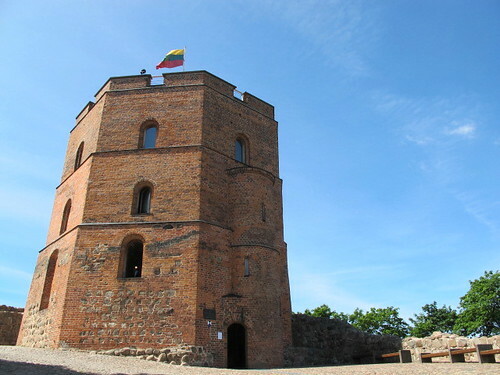 or they just thought it was cool that Lithuania was the last bastion of Paganism in Europe. I mean, I think that’s cool. Perkunas, the thunder god, is pretty damn cool if you ask me. 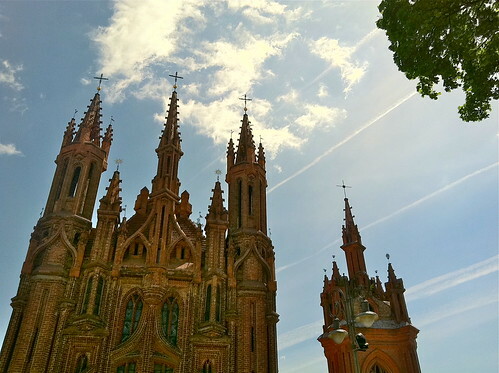 Of course, Lithuanians are mostly Catholics now, but you still see the roots of paganism in the culture. Whatever it was that brought these Japanese tourists to Vilnius, it also brought French, Chinese, Italian, British, and American tourists. They were everywhere. 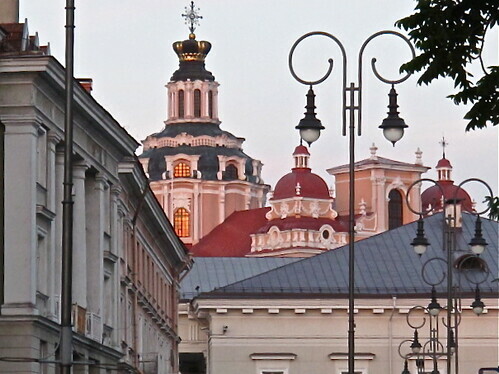 It’s true, Vilnius has a beautiful old-town and is a reasonably inexpensive destination. I stayed in two 4 star hotels (The Amberton and The Shakespeare) that were only about $165 per night and the food was ridiculously affordable and staggeringly delicious. But still, it’s in LITHUANIA. Here I thought, I was going to be the first to tell you how great Lithuania is and how you should be the first to rush over there so your friends would see how cool and pioneering you are, but I guess the word is out. Oh well, I’m still going to tell you about it just in case you’re one of the few who hasn’t already heard. 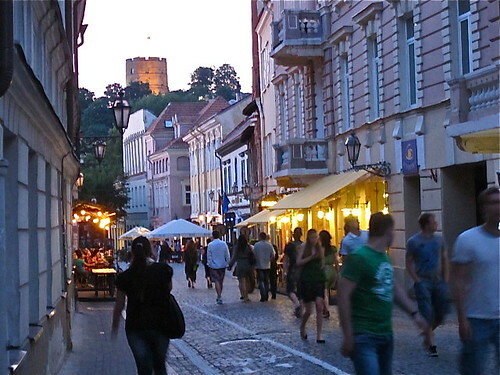 So maybe you’ve heard Lithuania is filled with cabbage, amber and basketball. Well, it’s true. You can get rauginti kopustai (sauerkraut) in most Lithuanian restaurants. 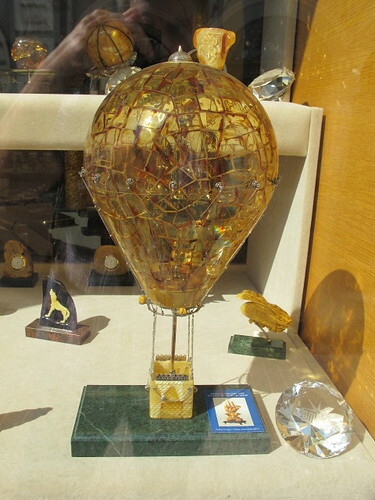 If you dare to venture into any of the numerous souvenir shops along Pilies Gatve (Castle Street), your senses will be assaulted by all manner of amber in every size, shape and hue you can imagine or not imagine. And basketball. Yes, it is akin to religion here and Lithuanians are legendary ballers. On the ’88 Soviet Olympic Team that won gold, 4 of the 5 starters were Lithuanian. Okay, aside from basketball, cabbage and amber, I’m sure you’re wondering what there is to do when visiting Vilnius, Lithuania. For starters, the last time I was in Lithuania was before the fall of the Soviet Union, so I’d never seen it as a free country. I was told by many friends that the difference would be night and day. And it was. 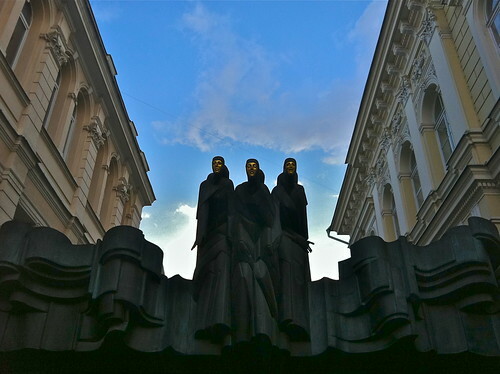 Even though plenty of hideous Soviet-era buildings still stand oppressively reminding everyone of the past, Vilnius’ old-town district is still beautiful, walkable and a pleasure to explore. It is one of the largest surviving medieval old-towns in Eastern Europe and has been included in the UNESCO World Heritage list, complete with its own castle tower, ornate churches and gorgeous central square. 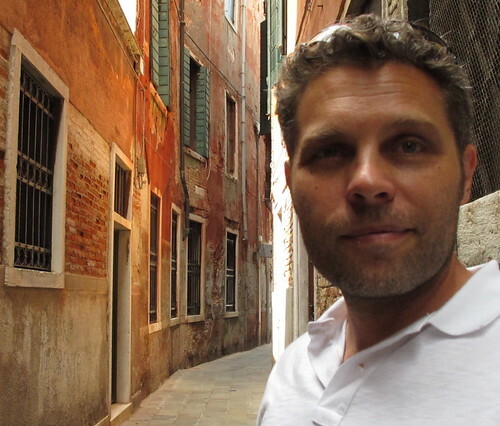 My girlfriend and I enjoyed exploring the boulevards and the side-streets, stopping at the numerous cafes for an espresso or cappuccino whenever we wanted to relax and people watch. The coffee was unreal. Consistently much better than most coffee in America at less than half the price. Our favorite neighborhood was Uzupis (beyond the river). This bohemian artists enclave is still rough around the edges, not unlike Atwater Village were I live in Los Angeles. 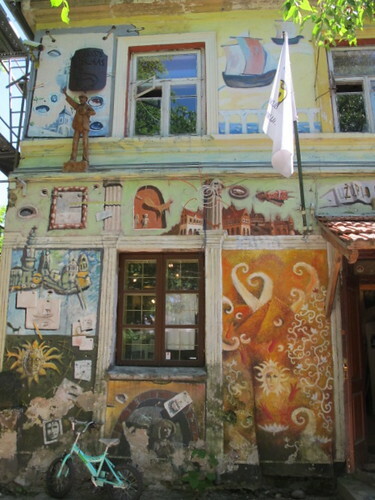 The “Republic of Uzupis” even has it’s own Constitution (established on April Fool’s Day). A building that used to be overrun by squatters has now become a mini art gallery for this “Artist Republic” complete with outdoor artwork and impromtu music performances. What’s more, there’s a nice restaurant, the Uzupio Cafe, right along the Neris river where you can enjoy a cold mug of beer, delicious food and even a mermaid. Did I just mention the delicious food? I was raised on Lithuanian food, but I rarely get to eat it now due to the complete dearth of Lithuanian restaurants in Los Angeles. 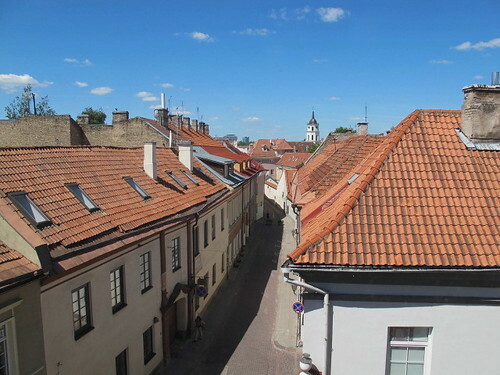 This trip to Vilnius was my golden opportunity to get my fill of Lithuanian soul food and thankfully, my girlfriend was gracious enough to allow me to choose Lithuanian restaurants 90% of the time. I mean, we’re talking pig ears and deep-fried chicken gizzards as a snack with some cold beer. I loved it. All of it. I’ve never felt better. 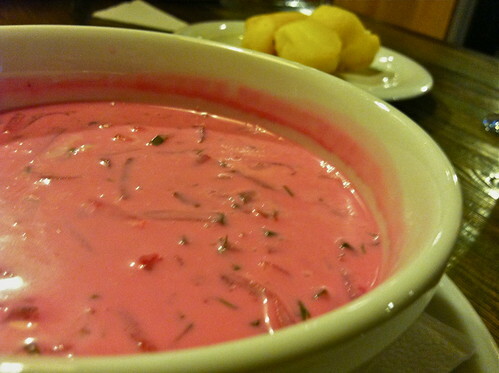 My frequent bouts of reflux went away instantly after my first bowl of saltibarsciai (cold beet soup). I chose to consume saltibarsciai every single day. Almost every single meal actually. I also ate and drank all manner of things that should have screwed up my digestion and made me feel miserable for hours after consumption. 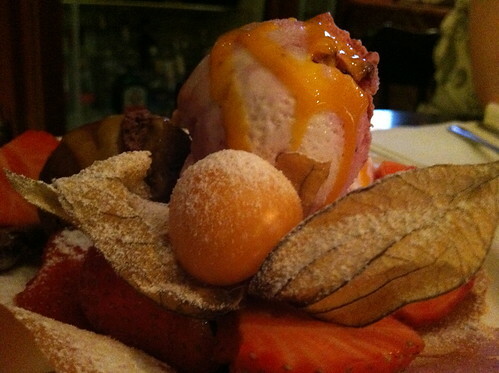 Lithuanian food is delicious, but definitely not delicate. We’re talking some heavy foods here: kaldunai (meat filled dumplings), kugelis (potato kugel), sionine (the most unreal bacon), bulviniai blynai (potato pancakes), kybinai (similar to empanadas), and what is widely considered Lithuania’s national dish, cepelinai (a ground beef and pork meatball surrounded by grated potato, formed into a massive dumpling and boiled). All these dishes tend to be served with sides of sour cream and bacon and washed down with mugs of beer. They usually sit in one’s stomach like a lead weight. But, ironically, my Lithuanian genes were clearly made to consume this fare in massive amounts. I ate everything I could get my hands on, felt great and still somehow managed to actually LOSE weight while doing so. My girlfriend also lost weight (but for the opposite reason). She was a good sport and tasted everything, including the pig ears, but I guess her palate and digestive tract is tuned slightly differently. I guess the “Lithuanian Weight-Loss Diet” (book to follow soon) was a win/win. In addition, to feasting on a daily, or rather hourly basis, I had the pleasure of relaxing with some old friends. One of whom I grew up with in Los Angeles, who has since moved to Vilnius and made it her home. Aside from all the food, coffee and beer, you can take an excursion to Trakai Castle and eat kybinai, walk up to Gediminas Tower and take in the view of the city, rent a car and drive to the seaside or simply enjoy a peaceful afternoon in beautiful Vilnius town square dining in an outdoor cafe and listening to a local jazz band. This entry was posted	on Tuesday, June 14th, 2011 at 3:14 pm	and is filed under Europe, Places. You can follow any responses to this entry through the RSS 2.0 feed. You can leave a response, or trackback from your own site.